Folk and black metal tend to share a common bond. Fallow Fields, being Harrow’s third full length album to date, takes an interesting ride down this route. Even the definition of the band’s name, which means “to wound or lacerate the emotions,” is an intriguing definition in itself to spark curiosity towards the band. Folk is very much alive and present with this album, but also melds a darker and grittier black metal touch to its overall feeling. The opening track Pathways begins the album with a folk influence backed strongly by the acoustic guitars. 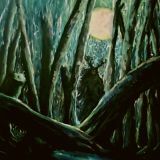 It’s a beautiful start, the kind of track that melds perfectly to the backdrop of a forest setting, but develops a more nasty sound with steady blast beats and noisy black metal riffs. The opening track is the longest, at over 14 minutes in length. While the track has great ideas floating around, it unfortunately felt to drag on at times. Through the Grey is a much more upbeat track that follows. Revisiting the acoustic guitars to begin things once again, the album at this point disbands from the harsh vocals a bit for a cleaner approach. While the folky tune may carry well, the vocals are very forgettable as well as once the black metal portion of things kicks into motion. The second half of this album is definitely another story. The main title track, Fallow Fields, is entirely acoustic. It casts a great atmosphere, especially infused with better, more powerfully sung vocals this time around. The track feels along the lines of something that Agalloch would write, which is a welcomed sound, but not going as far as labeling it a clone. Luckily the second half of the album maintains its strength with the final track Awake before the Dawn. Retaining a strong folk sound, the track implements mainly acoustic guitars, but it’s where the album shines its brightest. Fallow Fields may have not been able to grab my attention at its early stages, but the beautiful acoustic work during the second half really savored it for me. While it may not be the best folk and black metal record I have come to hear, Harrow have a solid sound that’s worth checking out.